Jet is a Wonderful Puppy! Yup, it’s true, Jet is an amazingly wonderful boy. 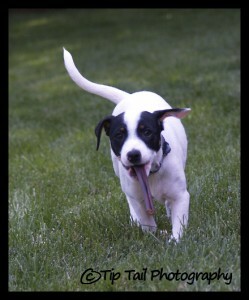 He zooms from room to room in the mornings after I get up… a bundle of energy. My other dogs have learned that mornings are not Mom’s favorite, so they kinda sleep and take a while to get going. Just like me. But Jet gets us up and about quickly and early! And, of course, I can’t resist how cute he is, so I have to play tug with him a bit, after I take him out to go potty. I got a kiddie pool yesterday and took Jet out in it, I hope he will like the water! I think so. I am getting him used to the clicker. He came already knowing how to sit, too! So I’m doing basic sits, stands and downs with him with a click and a treat, he thinks that’s great fun. And since he’s not a human kid, he doesn’t need acne treatment for his teenage years… boy I needed it when I was a teenager! Jet was 9 pounds 11 ounces at the vet on Monday. And we measured the squiggly guy last night, and estimated he’s about 12″ at the shoulder. I’m thinking he’ll probably grow enough to jump 16″ in agility… but we’ll see! What a cute dog! Jet is adorable! .-= Rochelle @ Fairy Princess Costumes´s last blog ..Fairy Princess Teen Costume =-. I just wanted to give you the heads up on a first-of-its-kind contest for dog related Blogs that my company – TrainPetDog.com – is holding to identify the 20 best dog-related blogs on the web. If your blog is selected as one of the 20 finalists, you’ll receive $50,450 worth of prizes from us, including invaluable exposure in our web site – viewed by more than 4 million visitors yearly – and in our weekly newsletter that is received by more than 600,000 people every week. Next Next post: What’s Tatum Up To?